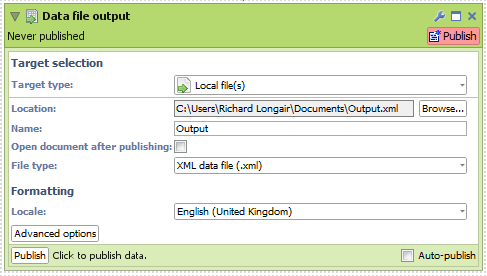 Scheduler: creating XML Actions files in file output? In earlier versions of 2.7 it was possible to have a file output block that would create an xml file. This was basically just a straight text output so we could have a data manager setup that would batch append a number of files and then a field organiser that would create a number of small xml scheduler processes that would move the files into a "processed" folder. 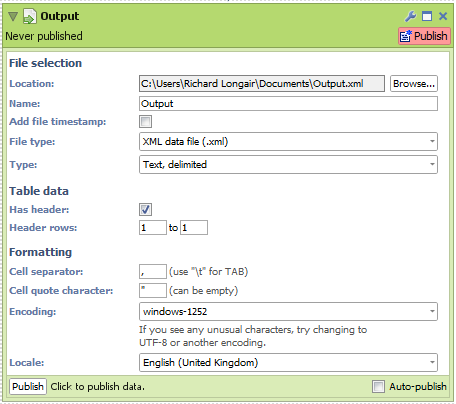 It seems in the recent versions of 2.7 and definitely in 2.8 this is much more complex (the xml output options put a number of preformatting in the output and doesn't pass "<" or ">" chars) - can we have this back as an option!! This sounds like an old bug affecting 2.7 and earlier versions of 2.8 which caused XML outputs to produce CSV content. The bug was fixed in 2.8 so please try downloading the latest build 2.8 b1190 from our website. I have attached screenshots of the incorrect 2.7 XML output block and the correct 2.8+ XML output block.